This is a very use full and simple circuit diagram for amplifying weak signal from a capacitive condenser microphone. You can use this circuit for sound sensing applications and some automatic robotic sensors. 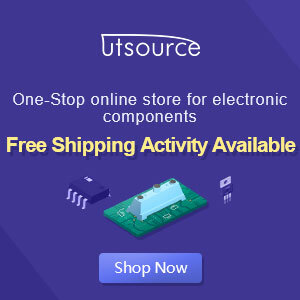 We have already posted an Efficient audio amplifier circuit using 1895 IC; it is somewhat complicated and suitable for very sensitive applications. 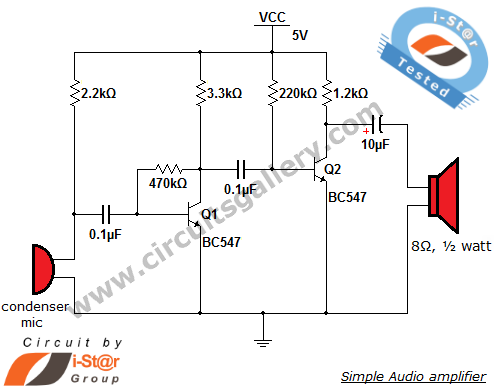 But this condenser microphone DIY audio sound amplifier is very small and simple to implement because it uses only two BC547 transistors and some discrete components. You can construct this circuit with minimum of $2 price. This circuit apt for cheap amplification purposes in electronics such as pre amplifier for FM Transmitter. The circuit is alienated into three divisions: Condenser mic, Audio amplifier and loudspeaker. Condenser mic is a type of capacitive audio sensor (audio transducer) that converts the sound (audio) signal into electrical signals. These electrical signals are too weak so it is amplified by the amplifier unit. The amplified output is obtained across the speaker. The output of condenser mic is coupled via a coupling capacitor of 0.1µF, the purpose of this capacitor is to remove DC contents in the audio signal. A 2.2kΩ resistor is used to give the required biasing to the condenser microphone. Transistor Q1 is configured as collector to base biasing mode. This is accomplished via 470kΩ resistance. This resistor provides negative feedback to the transistor Q1. The output of Q1 becomes available at the collector (across 3.3kΩ resistor), which is the input to the transistor Q2 via a 0.1µF capacitor. The capacitor removes DC voltages due to the biasing of Q1. Transistor Q2 is configured as fixed bias using 220kΩ resistor. It also provides further amplification. The amplified output from Q2 is available across the 1.2kΩ resistor. The 10µF electrolytic capacitor also used to block the DC voltages associated with the biasing of transistor Q2. Use 8Ω, ½ watt speaker to hear the amplified signal.